The other night, I woke up to the sensation of being bitten, thinking I was dreaming and turned on the light to see a very cross Melly looking at me with pinned back ears. Unsure of what happened, I whispered reassurances to him and he soon settled down for more cuddles – weird! Unsurprisingly, I learnt that cats do not like to be disturbed whilst sleeping and I put Mellys little strop down to me maybe boshing him while I was asleep. He has forgiven me, and all is good in the world again but I did learn some very interesting facts while reading through the online learning site. Did you know, that domestic cats share a common ancestry with African Wildcats? The African Wildcat actually looks like my Melly! A lot of the sleeping habits of our domestic furry friends are similar to those of the African Wildcat and when we look at the reasons for specific wildcat behaviour, it all makes sense. 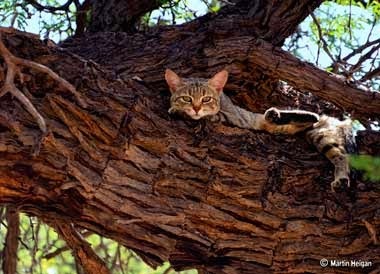 Wildcats make 40 hunting trips a day which is why they spend the rest of the time sleeping – to replenish energy levels. So our moggies are not lazy, they are simply conserving their energy – it’s genetic! They looks for a safe place to sleep, usually up high, to stay out of the way of predators. That’s why our cats feel safer on our beds, and chairs and washing piles! They rotate their sleeping spots, perhaps to keep parasite levels down. That’s why when we buy our cats beds they don’t always sleep on them! They often scratch when they wake up to stretch their muscles and maintain their claws. So that’s why my bed has scratch marks on it! You see, all the funny, quirky little behaviours are simply a case of ancestry! Apparently it is ok for Melly to wake me up - speak no evil?